Verken de 3.000 jaar oude Mendenhall-gletsjer tijdens deze 5,5 uur durende avontuurlijke tour vanuit de hoofdstad van Alaska, Juneau. Peddel op het met ijsbergen bedekte Mendenhall-meer ongeveer een uur totdat je de Mendenhall-gletsjer bereikt. Breng dan ongeveer een uur tot anderhalf uur op de gletsjer door. Daarna, peddel terug naar uw startpunt en warm op met een warme drank zodra u de kust bereikt. 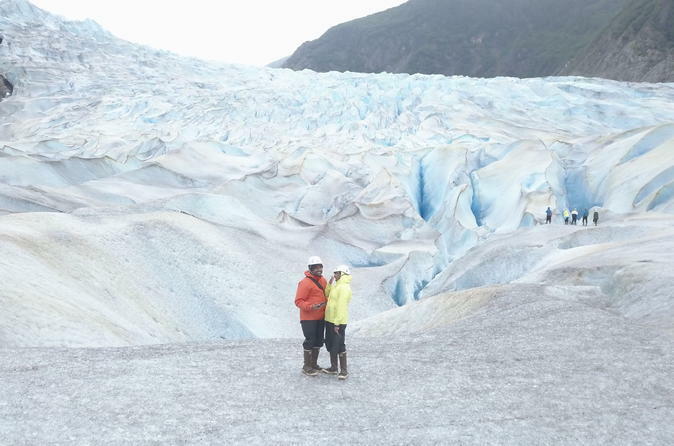 We loved everything about our time on the lake and our trek on the glacier. I can't say enough about our guides Moe and Andy. They're a perfect team with clear and encouraging instructions. They put safety first, and made us all feel confident and excited. 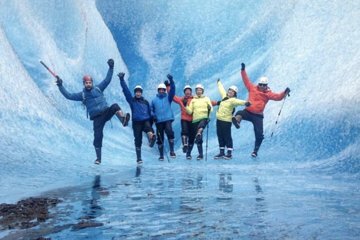 They clearly have a love and so much respect for the wonder and power of the glacier, it swept through our group and truly enriched our experience. Excellent and super fun experience! This was a once in a lifetime experience! Paddling across the lake, exploring ice caves, climbing on top of the glacier - it was awesome! Our guides Paul and Griffin were friendly, funny, and knowledgeable. It was amazing! This excursion was awesome! Great guides, very friendly and informative. The Ice Cave was amazing, a trip of a lifetime! We had an amazing time and the guides were wonderful. We explored an ice cave and hiked on top of the glacier. It was a once on a life time experience and I would highly recommend it! Rugged and spectacularly beautiful! The guides were knowledgeable and very helpful to those in the group who needed assistance. We paddled across Mendenall Lake, hiked across the glacier and into the glacier. Take gloves and a warm hat since, even in August, it got quite chilly as the wind whipped around the lake. Additional gear was provided by the tour operator. I would highly recommend this tour! It was disappointing that we were not able to actually go into the ice cave as seen in the photos. It would have been good to know this ahead of time.